Rent Breckenridge Resort | Corporate Events | Wedding Locations, Event Spaces and Party Venues. A perfect mountain town with stunning scenery, an impressive cultural heritage and a quaint Victorian atmosphere, Breckenridge is a year-round playground for guests of all ages and interests. Its charming Main Street is dotted with authentic buildings over a century old, housing the best dining, shopping and nightlife you can find in a ski town. With accommodations ranging from spacious hotel rooms to luxury condominiums, indoor and outdoor wedding venues boasting panoramic views and endless activities in all four seasons, Breckenridge sets the scene for a perfect mountain wedding. Contact one of our wedding professionals to help plan your special day. 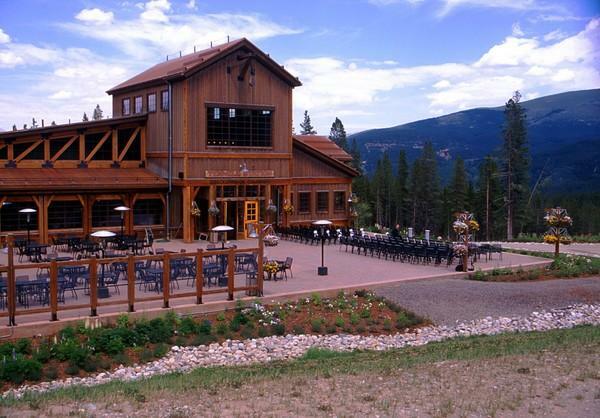 TenMile station is Breckenridge's premier wedding venue. Offering the most stunning and dramatic views in Breck, this unique on-mountain site is the ideal setting for a true Colorado experience. Tucked into the beauty and serenity of the National Forest and capturing the flavor of the West in its authentic architectural design, TenMile Station is the ultimate location for your special day. Cozy and serene, Mountain Thunder Lodge is a true mountain retreat. Surrounded by forest and wetlands, Mountain Thunder Lodge is intimate while offering the convenience of being just steps away from the heart of Breckenridge. Boasting an elegant ballroom with picture windows and French doors adjacent to both the forested ceremony patio and cocktail terrace, Mountain Thunder Lodge is the obvious choice for the bride seeking traditional elegance and the true mountain town experience.